Easter holidays are the perfect occasion to spend time together with the family. The daily routine engulfs us all and does not give us time to enjoy the company of our loved ones. But now we finally have a few days to disconnect and do those things we can`t do the rest of the year. So if you have decided to getaway to Gipúzkoa and stay at Sagarlore, we can recommend the following activities so that you can enjoy the heart of Astigarraga and everything that the surrounding area has to offer. The cider season starts in the middle of January and finishes at the end of April, so Easter, as it is in the middle of the season, is the perfect time to experience a sidrería. The traditional menu consists of: saltfish (cod) omelette, fried saltfish, beef rib (txuleta) and sheep`s cheese with walnuts and quince (nueces & membrillo). All this, is of course accompanied with cider from the barrel (txotx) or apple juice for the children – in fact many sidrerías have the option of a Children`s menu. In addition some sidrerías organize children`s workshops and activities for the family. And remember, even though the txotx season runs from January to April, some sidrerías are open all year round, so whenever you come to Sagarlore you will have the option of eating in one. San Sebastián, the capital of Gipuzkoa, is just 7 km from Astigarraga, a city that deserves a visit. There are many emblematic sights you have to see (Concha Bay, the Old Quarter, the port, the promenade on the paseo nuevo, the el peine del viento sculpture …), but if you go with children you must go to Monte Igueldo, a delightful fairground with spectacular views. Adults will also enjoy it! Another place that will delight you is Cristina Enea Park, a perfect place to spend time with the family in the fresh air. And if it rains, don`t worry! You can visit the Aquarium or the Science Museum (Eureka) - two educational plans that are sure to delight the kids. Let`s go for a hike in the mountains! If there is something that the province of Gipuzkoa can boast of it is its wealth of green zones. That is why the best plan for the whole family is to go for a hike. Moreover, Eastertime is in spring and the temperature is normally suitable for organizing activities in the open air. So, get some comfortable clothes on and get out to enjoy nature in its purest form! 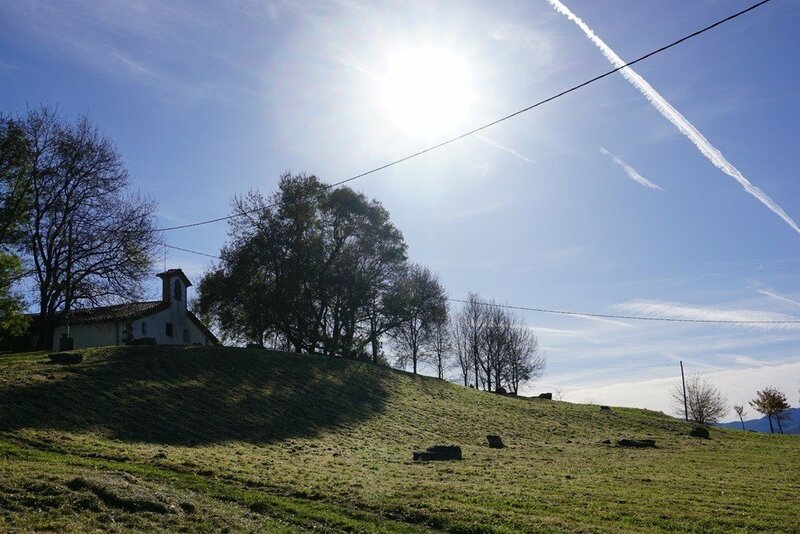 Close to Sagarlore you will find Santiagomendi where you can hike and at the same time discover the history of cider and its associated traditions, enjoying the views of farmhouses (caseríos) and apple stores (tolares) in the area. Also nearby is the Peñas de Aia Natural Park, which overlaps several boroughs in the zone – those of Irún, Rentería, Oyarzun, San Sebastián and Hernani. You can now see that there are almost an endless range of options. We are waiting to see you at Sagarlore so that you can enjoy Easter with your family!